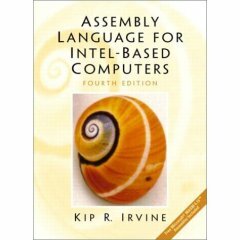 Why program in Assembly ? High-level language programs are portable. Compiler translates to the target machine language. 2. 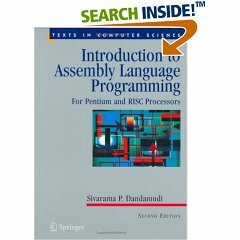 Why program in Assembly ? Assembly language programs are not portable! Learning the assembly is more difficult than learning Java! Programming in the assembly language is a tedious and error-prone process. High-level languages should be natural preference for common applications. I just don't consider a utility program that's 4 megabytes big, and contains all sorts of files that the author didn't create, to be really great software. Steve Gibson, Gibson Research Corporation. Assembly language programs contain only the code that is necessary to perform the given task. Embedded systems programming, e.g. aviation industry. Writing in-line assembly (mixed-mode) in high-level languages such as C/C++, or hybrid programming in assembly and C/C++. for investigating the cause of a serious bugs or crashes that require understanding of memory dumps and disassembled code. for practical and educational purposes. The "granddaddy" of all assemblers for the Intel platform, product of Microsoft. Available since the beginning of the IBM-compatible PCs. Works in MS-DOS and Windows environments. It's free: Microsoft no longer sells MASM as a standalone product. Bundled with the Microsoft Visual Studio product. Numerous tutorials, books, and samples floating around, many are free or low-cost. MASM32 development environment incorporates MASM assembler and Win32 API tools. Logic gates are used at the hardware level. How high-level language concepts, such as if-else statements, are realized at the machine level? What about interactions with the operating system functions? 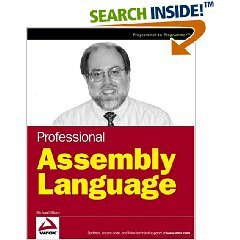 How is assembly language translated into machine language? These fundamental questions apply to most computer architectures. By using assembly, we gain understanding of how the particular model of computer works. Such secrets have been revealed to me that all I have written now appears of little value. St. Thomas Aquinas, December 6, 1273. MASM Reference Guide can be downloaded there, too. You can get Microsoft's Macro Assembler free: download Microsoft Windows Driver Development Kit (DDK), which contains both assembler and linker. Also, download Microsoft's Debugging Tools for Windows 32-bit Version. 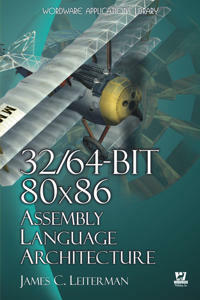 Take a look at Sivarama P. Dandamudi textbook info, Introduction to Assembly Language Programming , From 8086 to Pentium. Homepage includes free downloadable Microsoft assembler, MASM , and student slides. Last, but not least, Microsoft Macro Assembler Reference MSDN resource. 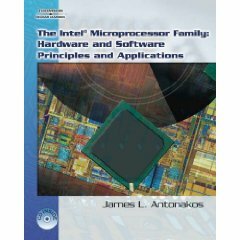 Volume 1 , Intel Basic Architecture: Order Number 243190 , PDF, 2.6 MB. Volume 2 , Instruction Set Reference: Order Number 243191 , PDF, 6.6 MB. Volume 3 , System Programing Guide: Order Number 243192 , PDF, 5.1 MB. It is highly recommended that you download the above manuals and use them as a reference. Professor of Computer Science at Middle Tennessee State University, Tennessee. "First go away and learn assembler, then come back and read this." An introduction to Win32 Assembler programming aimed at filling the gap between the complete beginner and the advanced. Highly recommended, in depth coverage of concepts. Use google to search for "MASM programmer's guide chm". Excellent book, lots of sample code, in-depth coverage of BIOS, Win32, MS-DOS. Advanced book for game and graphics programmers. ...edit, assemble, link, manage projects, debug and disassemble programs. ...produces code for 32-bit flat memory model appropriate to modern Windows. Test-drive fullscreen 32-bit debuggers: OllyDbg, Visual Studio, WinDbg. DUMPBIN: command-line utility that examines binary files and disassembles programs. Program runs on the processor. Program uses operating system functions and services. As far as 32-bit Vista is concerned, the world ends at 4,096 megabytes. A 32-bit program can address up to 4 gigabytes of memory. .386                ; Tells MASM to use Intel 80386 instruction set. 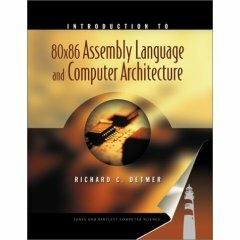 Assembly Language uses mnemonics, digital numbers, comments, etc. Machine Language instructions are just a sequences of 1s and 0s. Just as in high-level language, you want to control program flow. The JMP instruction transfers control unconditionally to another instruction. Conditional jump is taken only if the condition is met. Condition testing is separated from branching. Flag register is used to convey the condition test result. The EAX, EDX, ECX, EBX, EBP, EDI, and ESI registers are 32-bit general-purpose registers, used for temporary data storage and memory access. The AX, DX, CX, BX, BP, DI, and SI registers are 16-bit equivalents of the above, they represent the low-order 16 bits of 32-bit registers. The AH, DH, CH, and BH registers represent the high-order 8 bits of the corresponding registers. Since the processor accesses registers more quickly than it accesses memory, you can make your programs run faster by keeping the most-frequently used data in registers. 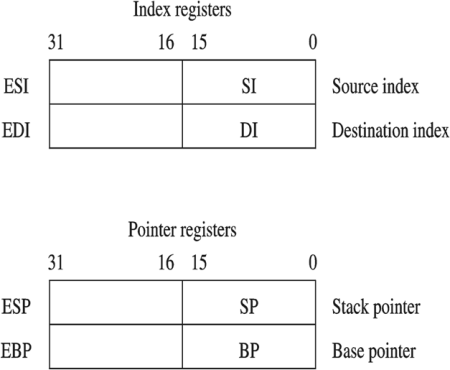 Similarly, AL, DL, CL, and BL represent the low-order 8 bits of the registers. 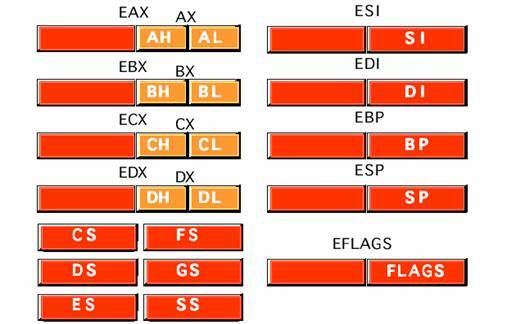 Four 32-bit registers EAX, EBX, ECX, EDX. Four 16-bit registers AX, BX, CX, DX. Eight 8-bit register AH, AL, BH, BL, CH, CL, DH, DL. Used exclusively to maintain the stack. Status flags record status information about the result of the last arithmetic/logical instruction. Direction flag stores forward/backward direction for data copying. TF Trap flag used in single-step debugging. The MOV instruction copies the source operand to the destination operand without affecting the source. Note: the above operand combinations are valid for all instructions that require two operands. mov    EBX,   table1    ; "instruction operands must be the same size"
mov    ESI,   status    ; "instruction operands must be the same size"
mov    [EBX], 100       ; "invalid instruction operands"
mov    [ESI], 100       ; "invalid instruction operands"
The above MOV instructions are ambiguous. Not clear whether the assembler should use byte or word equivalent of 100. The destination can be 8-bit, 16-bit, or 32-bit operand, in memory or in register. No immediate operand is allowed. Both INC and ADD execute at about the same speed. Both execute at about the same speed. The destination and source are not altered. Useful to test relationship such as < > or = between the two operands. Used in conjunction with conditional jump instructions for decision making purposes. Execution is transferred to the instruction identified by the label. Execution is transferred to the instruction identified by label only if condition is met. ; Assume that AL contains input character. ECX should be loaded with a loop count value before loop begins. Perform the standard bitwise logical operations. Result goes to the destination. where count is an immediate value. Performs left/right bit-shift of destination by the value in count or CL register. CL register contents is not altered. Bit shifted out goes into the carry flag CF. Specification of count greater than 31 is not allowed. If greater, only the least significant 5 bits are actually used. e.g. when the shift count is a parameter in a procedure call. Only CL register can be used. Only numeric constants are allowed. The convention is to use all UPPER-CASE LETTERS for names of constants. Assigns the result of expression to name. The expression is evaluated at assembly time.